Elsie Inglis (16 August 1864 – 26 November 1917) was an innovative Scottish doctor, suffragist, and founder of the Scottish Women's Hospitals. 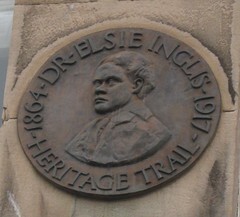 Elsie Maud Inglis. Founder Scottish Womens Hospitals France, Serbia, Russia 1914-1918, practiced medicine here 1898-1914.